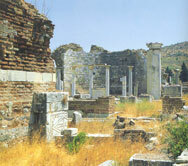 Church tradition indicates that the St. John moved to Ephesus with many Palestinian Christians around A.D. 65 before the fall of Jerusalem in 70. During Nero's persecution against Christians in Rome at that time, both St. Peter and St. Paul were martyred in Rome. As the leader of the Asian church St. John was targeted by Roman authorities and exiled to Patmos (Rev. 1:9). While on the Patmos Island St. John received his apocalyptic vision about the spiritual situation of seven churches in Asian as well as about the future of the church and the world (1:10-11, 19). The order of the seven churches - Ephesus, Smyrna, Pergamum, Thyatira, Sardis, Philadelphia, and Laodicea - follows a route that a messenger would naturally follow in visiting the cities. During St. Paul's ministry in Ephesus many churches were established in Asia.